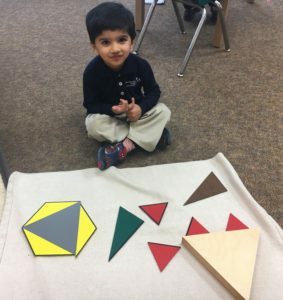 One of the things that set a Montessori preschool apart from normal daycare is the materials that are used in the classroom. In a regular daycare, children are usually given a variety of toys or educational games to keep them entertained throughout the day. 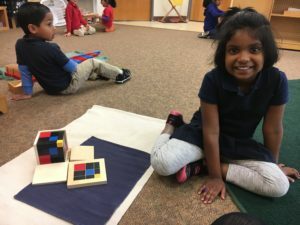 In a Montessori preschool, however, the children are provided with unique learning materials that are designed specifically to foster sensorial development. Dr. Maria Montessori believed that children began having sensorial experiences at birth. According to Dr. Montessori’s studies, as children grow up, they explore and learn by interacting with their environment through their senses. This unique period in a child’s development happens between the ages of birth and six years old. To help children express, classify, and broaden their sensory experiences, Dr. Montessori designed the Sensorial materials. The purpose of the Sensorial materials is to aid the child in refining the child’s pitch, temperature, and weight and is utilizing language in describing these qualities. These materials are an integral part of developing the whole child — directly building the “mathematical mind” and indirectly preparing for writing. Below are some of the Sensorial materials used in a Montessori preschool. The Pink Tower, the Brown Stair, and Red Rods are used to develop discrimination of differences in three, two and one dimensions respectively. 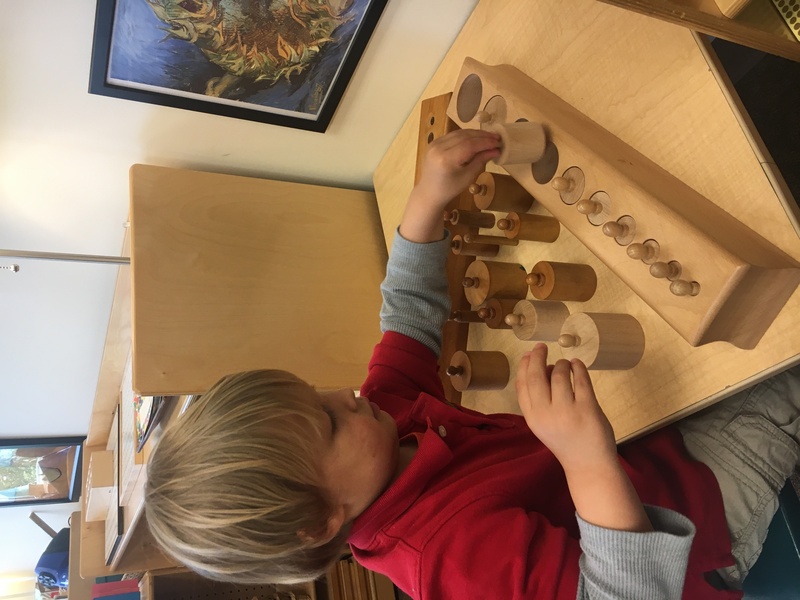 Cylinder Blocks (Knobbed Cylinders) are used to develop the child’s visual discrimination of size, which prepares the child for later work in math. Handling these knobbed cylinders also indirectly prepares and strengthens a child’s hand for writing. Knobless Cylinders develop a child’s visual discrimination of gradations of size in a series. The Knobless Cylinders also fine tune a child’s muscle coordination and sharpen concentration skills. The Color Boxes come with matching, as well as gradient style color tablets that the children manipulate in order from darkest to lightest. This helps children identify colors and develop visual discrimination. The Geometric Cabinet includes trays that contain insets of a variety of plane figures, which help children develop visual discrimination of shape as well as learn the names of the various figures. Constructive Triangles are used to form plane figures and help prepare children for geometry by refining discrimination senses. Binomial and Trinomial Cubes develop a child’s appreciation for the beauty of form in three dimensions. The cubes also indirectly prepare the child for mathematical concepts involving the binomial and trinomial theorems. Geometric Solids help a child develop the muscular-tactile sense as well as sharpen the visual perception of solid figures. Geometric solids also indirectly prepare a child for geometry and its language. Touch Tablets, Thermic Tablets, Fabrics and Thermic Bottles develop a child’s tactile senses as they touch and feel varying degrees of roughness, softness, temperature, and texture. Sound Cylinders and Bells develop a child’s auditory sense as they learn to distinguish volume and pitch and become more sensitive to sounds in their environment. Smelling Bottles and Tasting Bottles allow a child to discriminate one smell from another or one taste from another. The child then applies this knowledge to other smells or tastes in the environment. 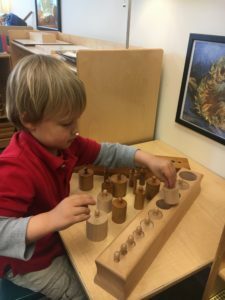 At Montessori Academy at Sharon Springs, you will find an extensive collection of Montessori materials. 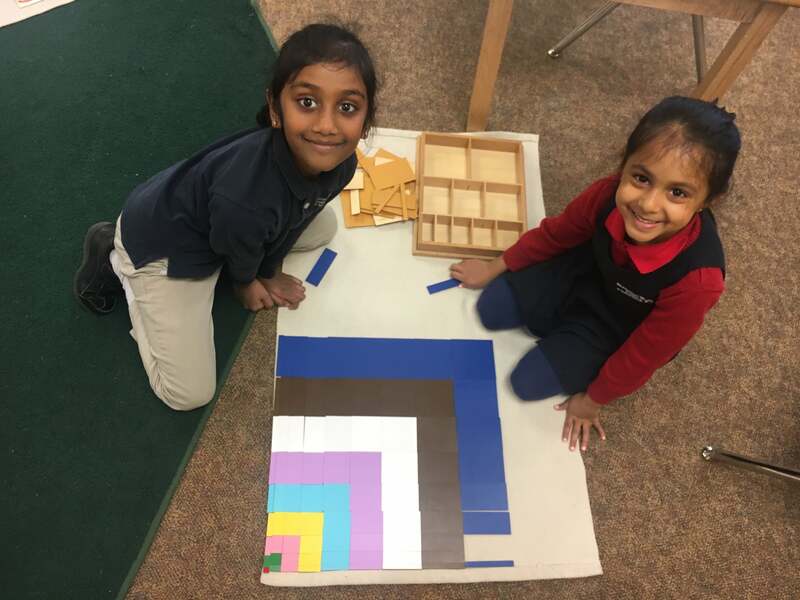 Unlike your average daycare, Montessori Academy at Sharon Springs is focused on enhancing each child’s sensorial experience on a daily basis. We take extra care in providing the most age-appropriate Sensorial materials in each of our classrooms.